Although Mary is a herb grower, I found her article not just highly informative, but also relevant to the bushfood industry. The Ed. If one has a desire to be a successful farmer (whether this be small crops, bushfoods or herb farming), then the three Ps are essential elements of success. My old alchemy teacher would also suggest that we take into consideration the phases of the moon, the earth and the sun. I have linked the three Ps with these three interconnected elements. This article is based on the assumption that the reader is a first time farmer. If you're not, please excuse the obvious comments. Be very clear about what your growing area is or is likely to be, be realistic about your energy levels and about your access to physical assistance from others. Once the framework of your growing area is established you can begin to be intuitive about what should go where. In general, take advice from the hands-on farmer - armchair experts can give you a heap of information which is basically compost. Always remember that growing conditions in an area can vary within the space of 20 kilometres and that micro-climates can increase this variation enormously. Unless you have experience, plan on doing trial plantings - enough to fill a minimum market requirement, ie 1/3 of an acre each of three species. This exercise will give you an idea of how the market operates and your own strengths and weaknesses - not to mention how well the plants grow! Consider what the structural requirements will be. They could include such things as rain shelter, outdoor shower, toolshed, tables, processing sheds, drying systems, loading ramps - to name a few! From the feminine perspective, look at how you will nurture yourself as you work. It may be appropriate to have a fridge set up in the work area, cool water/beer can be a real luxury on a hot day! My planning was done with great gusto. I talked with as many people in the industry as I could find who were prepared to offer knowledge and did the odd crash course. I was talked out of doing a lengthy herb course, the logic being that I would become an expert in, say, three herbs but would learn more by doing. This has proven to be the case. I have probably made more mistakes this way, but they are indelibly etched. As an old saying goes - `the answer lies in the soil.' Being in a high rainfall area (this means different things to different people, my understanding of `high' includes consistent) I believed that the methods suggested in certain texts would be the appropriate ones to follow. I built mounded beds, covered them with newspaper before mulching...wrong! First, my soil was in a poor condition with little or no earthworm activity. So, instead of the paper breaking down, the rain ran off the compacted sheet mulching. Also, high rainfall does not translate into a steady pattern. In my case, you can get a quarter of your annual quota in three days! pH tests had shown the soil to be highly acidic, so dolomite was added and later rock phosphate. This is fine for the pH and the health of the soil but building up organic matter by way of mulch and green manure crops will take time. Sandy soil without organic matter and thus without water retention translates into an excess of watering and an imbalance of surface roots. With your `earthworks' planning, if it is at all possible, organise to have this work done at the beginning. You may require swales, drains, dams, beds, water tank or shed/shade house pads. Doing all of this at the beginning allows time for the earth to heal and, from a practical viewpoint, means that you're not bringing earthmoving machinery into an existing growing area. If dams and/or bores are required, check with local authorities - our ground water and the health of our catchments should be of highest priority in your planning - your `microsystem' may be sustainable but does it add to the health of the region and thus the larger sustainability? Grow organically, add natural elements to improve the soil and the earth will reward you. You have done all the hard, physical work (masculine, if you will) - now you reach pay dirt, or perhaps future pay dirt. A lot of wholesalers treat growers like a secondary banking system . It is not uncommon for growers to be paid 60-90 days after delivery. In your planning, allow for this cash flow glitch. You will find that packaging materials, drying facilities, electricity etc need to be paid for up-front, not when your produce check finally arrives. Have the reserves you need! When your produce is ready for the market, always double check that the market still exists prior to harvest. If the market has disappeared, you will not have wasted resources on harvesting and post harvest activities. If your plants are annuals, you may think of preserving them till the market picks up (but be sure to count the costs of the drying or freezing and storage) or you may find it is cheaper to treat it as green manure - much as that may hurt! If your plants are perennial, you could look at using the fruit for seed, freezing, drying or processing it in some way or simply letting it feed the fauna. Needless to say, at this stage you will have to make some decisions on the longer term market potential for your crop. If it's not there, don't kid yourself. Be optimistic by all means, but take a pragmatic (left brain) attitude towards realistic returns. "Grow organically, add natural elements to improve the soil and the earth will reward you." Assuming a successful harvest and an ongoing commitment, the cycle starts again, with planning, preparation and production. Hopefully, by this stage, the growing function is more refined. As to the elemental forces of the moon, the earth and the sun, I use the astrological phases of the moon as a planting guide. My physical activity is guided by the fertile signs for planting, infertile signs for weeding, pruning and general maintenance and the last week of the old moon for applying fertilisers, making composts and liquid manures. The earth's needs take on a more refined perspective when soil tests are done to assess soil requirement. The observation of weeds and grasses growing on the land is also an excellent indicator of what the soil's condition is. The influence of the sun on the plants may indicate the appropriateness or otherwise of your placement. Watch their progress - some plants may need to be moved to benefit from less or more sun...and the planning cycle begins again. Successful growing. Wandu Yerta Native Plants and Produce was established in 1998, three years after we purchased a property at Finniss. Prior to the settlement of the propert, we searched for a name which depicted how we felt about the land. Wandu means good, originating from the Adnyamathanha people and Yerta, originating from the Kaurna people means earth, land, soil or country (it is hoped the use of these words does not offend any people). The name Wandu Yerta expressed how we felt. Wandu Yerta had previously been grazed way beyond its carrying capacity and was infested with weeds and vermin. It was therefore our resolve to rehabilitate our land by removing stock, revegetating and allowing natural regeneration to occur. After much research, we chose which species were appropriate to revegetate with, opting to grow and nurture the plants ourselves. After collecting numerous seeds, propagating and germinating many local plant species, Wandu Yerta Native Plants and Produce was created. The next challenge that faced us was growing an economically viable product from the land which did not compromise our landcare principles. After reading articles and speaking to knowledgable individuals and organisations, our interest in the bushfood industry was provoked. We wanted to plant indigenous species, to optimise their chance of survival as they are adapted to the local soils and climate. 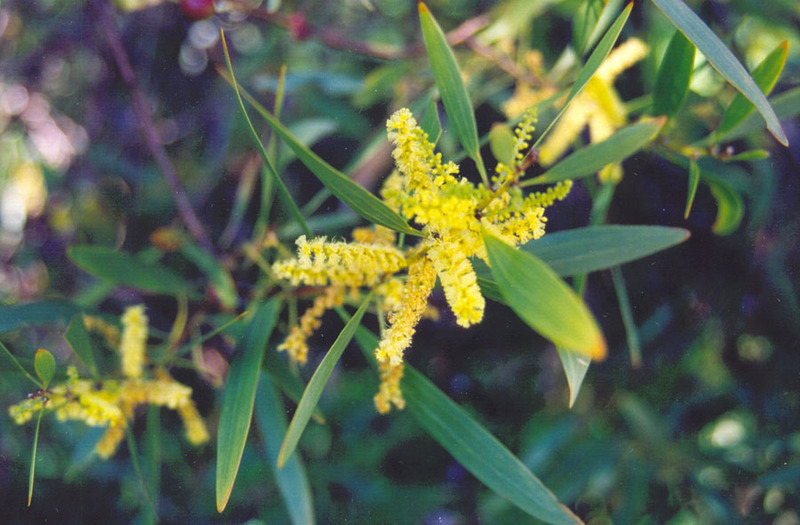 Wirilda or swamp wattle, Acacia retinodes was our chosen species. Our business is primarily a native plant wholesaler and retailer which is venturing into the unknown waters of the bushfood industry. In May 1997, we ripped 2 acres of broken clay, fortunately, excellent rains followed. It was our understanding that rows should be spaced at 2 and 3 metres intervals, however an in situ meeting with Primary Industries provided us with contrasting information. Ideally, it was suggested that rows be planted approximately 5 metres apart. As our rows were already 2 and 3 metres apart, it was proposed that we do an experimental area of rows at 2 metres apart and the remaining area in rows 3 metres apart, skipping every 4th row. Just is we began to take pride in our efforts, we noticed that many (at least one in every 4 or 5 of the seedlings) were being snapped off or entirely pulled out of the soil. An unobtrusive survey one afternoon provided us with confirmation of our suspicious. We were inadvertently providing the local cockies with recreational activities as they destroyed the seedlings for no apparent reason other than `having fun'. In response, we promptly established tree guards around all the trees and re-planted those which had been destroyed. Our next planting took place in July, 1998. 200 more Acacia retinodes were put in. Soon after, we needed to re-guard about 10% of the trees as the kangaroos were stripping the plants, both young and old. We entertained the idea of establishing an electric fence around the area, however, we did not feel right about this and were unsure as to whether this solution was appropriate for this problem. A future concern for us is that other bushfood species (particularly those less hardy than Acacia retinodes) will not survive the impacts of the local Kangaroos. To be perfectly honest, we feel anxious about the stages that will follow, the harvesting, storage, distribution... and of course as commercial growers, the possibility of `value-adding' to the product is a matter of contention. But, for now, we are very proud of our accomplishments. Our Acacia retinodes that we grew and nourished from seed are thriving. Eventually, we hope to plant other bushfood species in the hope of establishing a real ecosystem. From a business perspective, we expect our activities to integrate the development of native plants and produce with ecologically sound land management principles. We are still novice growers and hope that by documenting our efforts we will learn from our mistakes. Despite the few obstacles that have come our way, we are very enthusiastic about the bushfood industry and hope to contribute to its fruition and longevity.